Under what versions of Windows does PowTTY run? What type of keybindings does PowTTY use? Does PowTTY support local editing? Why doesn't a semi-colon (';') execute multiple commands? How do I set up emacs for local editing? Why can't I toggle remote editing during my session? How come AltGr doesn't work right? PowTTY has been designed to run under all kernal32 versions of Windows OS. This includes: Windows 98, Windows NT, and Windows 2000. Unfortunately, Windows 95 is not supported. Cancan95 is a possible solution should you be forced to remain on Windows 95.
copy/paste highlighted text is automatically copied to the clipboard. In addition to ctrl-V and shift-Insert to paste, the middle or right mouse button will paste. Yes, PowTTY supports the MUME editing protocol for editing remote files on your own pc directly. You can use any editing program. However, there is a known bug with emacs: you must not use 'runemacs.exe'. The design of 'runemacs.exe' calls a false executable, which tricks PowTTY into thinking that the editing session completes as soon as it opens. 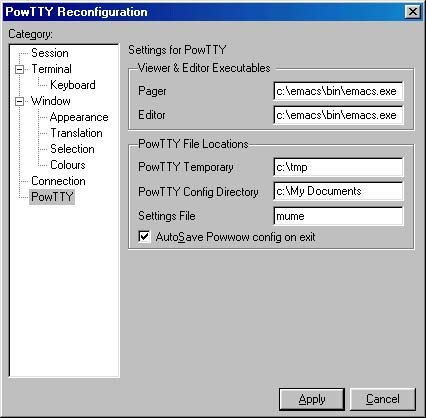 The PowTTY command separator is a pipe ('|'), not a semi-colon as it is in powwow. You must a win32 install of emacs on your machine already. Then, set the the full path to the executable in your 'pager' and 'editor' boxes. Whenever PowTTY launches emacs, it will create a console window, but that is a by-product of emacs, and unavoidable. Although PowTTY is written primarily for MUME, the developer wanted to make it usable for other muds. On MUME, you can still toggle local editing by using the "#identify" command on the client, and then by using "change editor line" or "change editor mume". For the AltGr key to work: On the configuration tab, underTerminal-Keyboard check "Applcation and AltGr act as Compose key".